Let’s get it started with the #1 best selling carpet cleaner from “Hoover”. The brand carries its reputation to the top with their special functions. 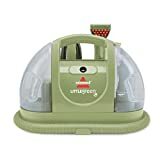 Wash and Rinse selector allows you to wash the carpet with detergent and water while the rinse will come shortly after to clean the soap by using only water. The Automatic Detergent Mixing System is included to blend both water and detergent in the right amount for great washing result. 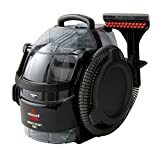 SpinScrub technology gives 360-degree cleaning along with DualV Nozzle that has equal suction to take out the dirt quickly not to mention the forced heated air for a fast dry. The weight of this machine is less than 19 pounds, and it comes with the size of 8-feet. To make it more convenient, Hoover has added Smart Tank system to ease with fill, empty, and clean. Grab it now, and be the first to get the 2-year limited warranty. Highly recommended for the carpet that has deep-down dirt and stains. 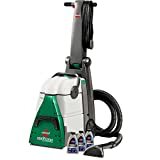 This beasty carpet cleaner has 4-row dual rotating dirt lifter along with powerful brushes, no dirt or stains can stand a chance with this one. On top of that, it also comes with hot tap water and carpet formula which is famously known for its greatness against deep-down dirt and stain. What you will get from the package are Lint screen, removable nozzle, trial sized formula, built-in measuring cup, and 1-year warranty. Another great product from Bissell again, but this time they offer a portable carpet cleaner. Specially designed to deal with deep stains and dirt at the hard-to-reach area, stairs, carpet, upholstery, etc. 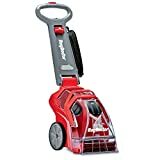 5 flex hose and long reach 22 power cord will make sure that no matter where the dirt is, this carpet cleaner will get them all. After purchasing, you will get 3 tough stain tools, and 8oz Professional Deep Cleaning formula. Sit back and relax, Rug Doctor’s got this. The Dual Cross Action Brushes will eliminate any dirt or stains on its way. For a quicker and more effective cleaning, a manufacturer has added 75% more suction to the machine along with Deep Carpet Cleaner (Carpet + Rug Institute). Coming with Super Boost Spray option, it is suitable for cleaning on furniture, narrow spot, upholstery, and high-traffic areas. And, there is a 100% satisfaction with an immediate result from Rug Doctor. Have not had enough of Rug Doctor? We have got another one for you. We dedicate this product to all pet owners out there who are struggling with the smell created by their pets. Some stains come with the bad smell which is unbearable, but doesn’t worry! Platinum Urine Eliminator that has pro-enzymatic formula will make these two things perish within a few minutes. Cleaning, scrubbing, extracting, and dealing with bad smell from your lovely pet, this mighty pro carpet cleaner has it all. Order now and you will get mighty pro x3 machine, upholstery/stair tool, a bottle of pet formula carpet (40 Oz), and Urine Eliminator Spray (24 Oz). Hoover has just delivered a very powerful carpet cleaner that everyone has been looking for. When we use the term powerful, we really mean it. A wall of pressurized water on this model can extract stubborn stains effortlessly by using the relentless and constant spray on the targeted area. The DualV Nozzle Technology, Heated Cleaning, and Exclusive Spinscrub Technology (360-degree rotations) allows you to clean your carpet from any angle and dry it in a faster duration comparing to other products. To ensure high cleaning quality, clean and dirty water are separated thanks to the Smart Tanks System. 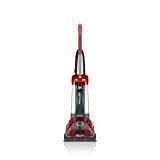 We just cannot resist another great product from Hoover. The first thing to notice on this model is its Clean Surge Control. You can add more detergent on strong stains or heavy traffic areas with fingertip control. 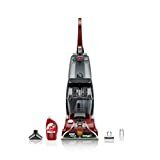 Most of Hoover’s products comes with 360-degree cleaning, allows you get on all sides of the carpet and upholstery fibers. 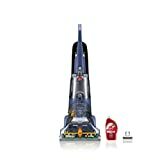 It also has 3 level of power control (3-Speed Brushroll) to suit your cleaning condition (High, Low, off for spill pick-up). Smart Tanks System can also be found on carpet cleaner as well. Dirt Devil, ladies, and gentlemen! Regardless of being made os plastic material, this one is fully functional and can be as good as some top products. With Spot Magnet Turbo Brush and High-Velocity Suction-High powered pick-up, stubborn stains and tough dirt are not a problem anymore. Super easy to clean by following the 3-step cleaning instructions: 1-Fill, 2-Wash, and 3-Rinse. Do not miss this out on this super lightweight carpet cleaner. 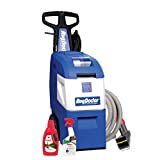 If you are looking for one of the most portable, best carpet cleaning machines, then this one might be your alternative choice. The overall dimensions are 9-1/10 by 18-4/5 by 13-1/4 inches, small enough to carry around. Despite coming in small size, its cleaning ability will surprise you. Suction and strong spray accompanied by tough-stain brush are all well-equipped in this model to cope with dark-and-deep stains or any harsh dirt on your carpet. Built with environmental concerns in mind, most parts of it come from recycled plastic. Bissell also offers 1-year limited warranty upon your purchase as well. Keeping the best for the last, we are looking at one of the most highly recommended best carpet cleaning machines available on market today. For quick cleaning, the producer has created 2 level of forwarding and backward pass to catch any leftover dirt from the first swipe, which prevents you from constantly going on the same spot. The Rotating dirt lifter with its powerful brushes along with stain tool will eliminate deep-down dirt from anywhere especially the hard-to-reach spot that you could not get close before. With the large capacity water tanks, you know this model is up for a big clean up. The top offer, 2 professional deep cleaning formula (detergent) will be included in the package. After critically going through our top 10 best carpet cleaning machines reviews, have you found your favorite yet? I hope what you have been looking for so long can be found here, and you can grab your new carpet cleaner with confidence.